NETWORK FINALS: The only change from early numbers was a 0.1 dip for THE EXORCIST. CABLE HIGHLIGHTS: Discovery once again led Friday cable, with GOLD RUSH up 0.03 to 0.97, and TREASURE QUEST also up 0.03 to 0.47. Both of ESPN’s NBA games were in the Top 4, Golden State vs. Boston at 0.74, and Clippers vs. Sacramento at 0.53. Fox News found a new way to capitalize on Donald Trump’s election, with a tour of Trump Tower titled OBJECTIFIED at 0.53, and THE O’REILLY FACTOR was also in the Top 10 at 0.31. Disney Channel had a trio of early morning shows in the Top 10: LION GUARD down 0.08 to 0.35, DOC MCSTUFFINS up a tick to 0.35, and MICKEY’S ADVENTURES IN WONDERLAND at 0.34. 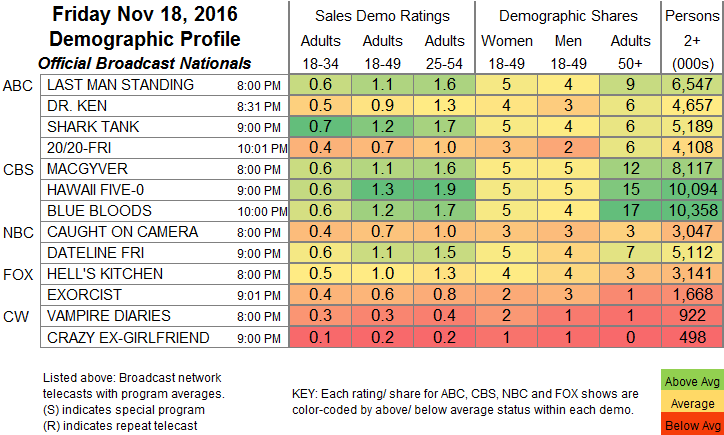 HGTV’s HOUSE HUNTERS and HOUSE HUNTERS INTL were both at 0.31, respectively up 0.08 and 0.04. On Food Network, two episodes of DINERS, DRIVE-INS & DIVES were at 0.31/0.30. On We, MARRIAGE BOOT CAMP ticked up to 0.26, and MY LIFE IS A TELENOVELA was also up a hundredth to 0.06. TLC’s KINDRED SPIRITS added a tick to 0.20, and A HAUNTING aired 2 episodes at 0.15/0.14, down from last week’s 0.17. On Syfy, Z NATION fell 0.05 to 0.20, and VAN HELSING was down 0.03 to 0.14. OWN’s FOR BETTER OR WORSE climbed 0.03 to 0.20. Without a REAL TIME WITH BILL MAHER lead-in, TRACY ULLMAN’S SHOW plunged by a tenth to 0.06. 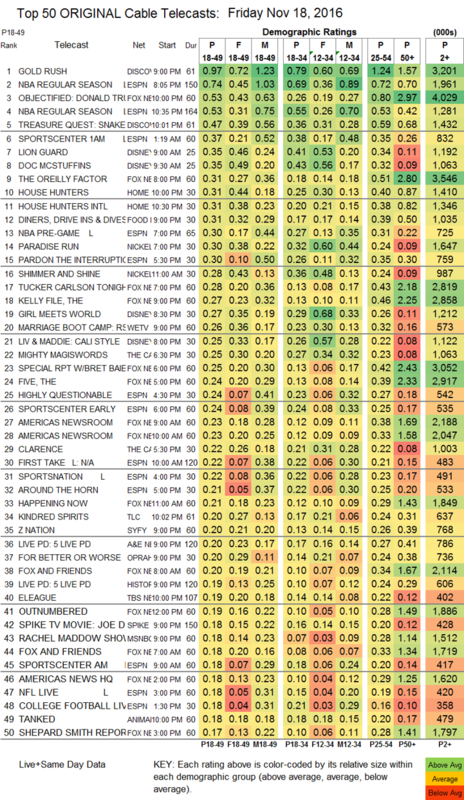 IFC’s 2 episodes of COMEDY BANG BANG were at 0.04/104K and 0.03/73K, a bit above last week’s 0.03/0.01.